Ancora House - New Pics! New Listing on Alder Lake! Newly Remodeled and Private Location! 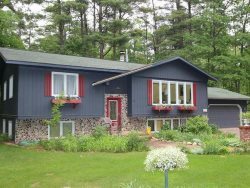 Relax in the Northwoods at Ancora House, the perfect location to stay and play in the Northwoods! Enjoy this the peace and quiet of nature and the beautiful landscaping at this home. Spend time outside on the comfy patio set while the grill sizzles your fresh catch and the kids play in the spacious back yard. Delight your senses along the short nature path down to your private dock where endless summer days are spent swimming the sandy shoreline or trying your luck as you cast your reel hoping to catch the big one! Watch for shooting stars as you sip your night cap around the fire pit, roasting mashmellows or just enjoying the peaceful night. Feel at home in this newly remodeled, well appointed home! With room for everyone, this spacious two level home has everything you need for year round fun. You are sure to have a restful night's sleep in one of the brand new beds! Settle in for a night of fun at the lower level wet bar or snuggle on the couch watching your favorite movie. No matter how you like to spend your time, Ancora House is your perfect vacation destination. Alder Lake is a 264 acre lake located in Vilas County. It has a maximum depth of 30 feet. Visitors have access to the lake from a public boat landing. Fish include Musky, Panfish, Largemouth Bass, Smallmouth Bass, Northern Pike and Walleye. Check out more information about Alder Lake! Just minutes from Cranberry Square Farm & Market!